Do you hear the people sing? Singing the songs of angry men? When you visit Paris, if you listen carefully, you may just be able to hear them. Made popular by Victor Hugo’s Les Miserables, the French Revolution has been captured by the media and remade into countless school musicals and a recent award wining motion picture. The French Revolution was in fact inspired by the American colonists rebelling from their monarchy. The French decided that starving was not worth their tyrannical monarchy, as who could subsist on cake alone? The rebellion lasted from 1789-1799. In that time, the little people of France took over, killed their monarchy, had a period of political upheaval, and set the path for a little leader of his own right to come in and take over. For your next vacation in Paris, follow the rebellion through the cobble streets to see the major landmarks of the French Revolution. The Bastille was a fortress in Paris that was stormed by a crowd on July 14,1789, as it held thousands of pounds of gunpowder. On that morning, 900 French revolutionaries gathered demanding to be let in, and when the French troops arrived chaos ensued and 83 people died. This serves as an incredibly important symbol for the French Revolution, and France celebrates its independence every year on this date. 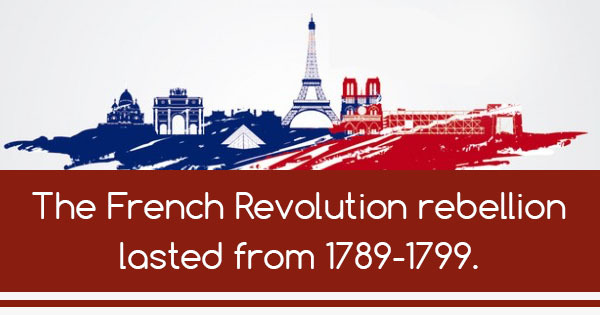 2015 marked 226 years of French independence. This fortress was taken down, and now there is a commemorative square in its place. Now named Place de la Concorde, this square was the site of many guillotine executions during the revolution. Aptly named Place de la Revolution, it was here that King Louis XVI was executed on January 21, 1973, along with his wife Queen Marie Antoinette, and numerous other members of the French government. For anyone that takes a Paris vacation, this is a must see! If you have a love for military history, no vacation in Paris is complete without visiting Les Invalides. This is a group of buildings containing artifacts and stories of French military history from the Revolution to the present. You can also see the sarcophagus of Napoleon Bonaparte, the little leader who could. When visiting Paris, it is crucial you visit the Catacombs, an extremely unique Parisian museum. Located 20 meters underground, the Catacombs hold the remains of over 6 million unfortunate revolutionaries. With skulls and bones stacked high to the ceiling, this ancient maze of tunnels is a must see for any vacation in Paris, but just watch your step! When you are strolling along these sights, keep your ears open and you may just hear whispers of ‘Vive La France’echoing around you.